In Classical Times knowledge of minerals was based almost entirely upon philosophical speculations. Aristotle is the first known to us to have presented a comprehensive theory of the origin and nature of minerals. In his Meteorologica he advanced the theory that all natural substances consisted of four properties, dryness, dampness, heat and cold, and these were combined in the four primitive elements, water, air, earth and fire. Another early treatise on minerals was De Mineralibus by Theophrastus, a contemporary of Aristotle. Theophrastus accepted the theory of four primitive elements and separated mineral substances into two classes, those affected by heat and those not affected. The next important work on minerals was the monumental Natural History of Pliny, an encyclopedia of the entire field of Nature, written in 77 a.d. In it are collected all the theories, fables and observations of Greek, Latin and Oriental writers up to that time. This work served as the au­thority and source book for writers on Natural History subjects for six­teen centuries. 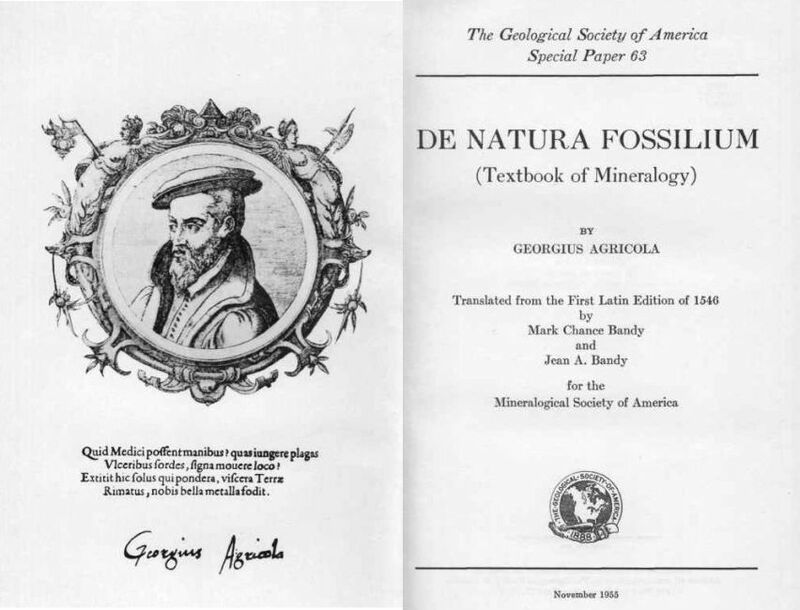 There was no important work on mineralogy from the time of Pliny until Agricola published his De Natura Fossilium in 1546. During the intervening fourteen centuries that spanned the rise and fall of the Roman Empire and the Dark and Middle Ages, writers on mineralogical subjects merely elabo­rated on the information and much of the misinformation contained in Pliny's Natural History. The development of mineralogy, if it could be called development, can be traced through the numerous lapidaries and encyclopedias that began to appear after the time of Pliny. Agricola, with the opportunity and desire to study the physical properties of minerals by observation, was able to work backward through the litera­ture and separate many facts about minerals from the mass of fantasies of the earlier writers. He was the first to propose a systematic mineral classification, one based upon observed physical properties. 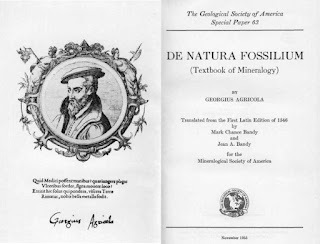 It is for this contribution in De Natura Fossilium that he is justly known as the Father of Mineralogy. Aside from its historical interest this work is of particular value in giv­ing mineral localities and describing the occurrence of many ore minerals for the first time. Philosophy which treats of the origins, causes and natures of things, Illustrious Prince, has been divided into many parts and must explain very difficult things. For example, it expounds the divinity and reality of God, the heavens and stars, the elements, causes, interrelationships between these things, changes in the atmosphere, as well as living and subterranean bodies and their origins. The concept of God has aroused all nations and peoples but the Jews, Egyptians and Greeks were the first to consider the nature of God. The Chalddeans after long observation and the Greeks after careful study came to know the stars and learned to measure the heavens. The Greeks, more than any other people, studied the elements, their causes, and the interrelationship between natural bodies. Aristotle considered the movements and changes in the atmosphere as well as the species, nature and origin of living matter. Theophrastus has discussed the causes and natures of original life. But the subject of subterranean things in which we are most interested has never been properly treated.